I know what you are thinking. Based on the fancy pants ingredients in this dish and the haute descriptions, this seems like something reserved for trust-fund babies and old money fat cats. Not the case, plebian reader. I like to think of this as superior breakfast for the adventurous palette. Got a little time after a hard week and want to treat yourself to something lovely? Snag the ingredients for truly THE best bacon, egg and cheese of all time. I’m talkin’ eternity. 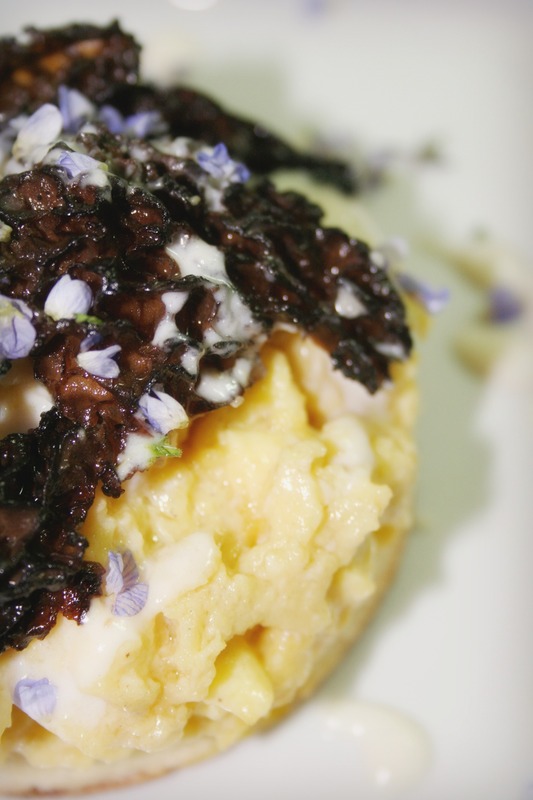 This recipe is a lovely tower of creamy eggs, rich goat cheese bechamel, savory morel mushrooms, and prosciutto baked until crispy as bacon. The whole mix is atop a toasted round of brioche (cut with a $1 ring mold – pick one up and start impressing folks with your presentation skills) and topped with seasonal violets and leaves of fresh thyme. I usually tell people to make dishes for people that they love, but this is reserved for people in the upper echelons of your love contingency. Like the top 5. Truthfully, you can go into this very budget-mindedly without sacrificing on taste. Brioche can be replaced with challah or another cheaper, eggy bread. Goat’s milk cheese can be acquired for a reasonable price and at most grocery stores. Same deal with the prosciutto. There is no replacement for morels and truffle oil, but they are your only splurge and you won’t be using a lot of them. If you want my opinion, although it won’t be nearly as luxe, you could get away with replacing the morels with a super fresh in-season mushroom and leave out the truffle oil. Not the same dish, but still decadent as hell. But really, get the truffle oil. You use so little and if you’ve never had truffles before, you need to. You really, really, really need to. Like now. This recipe was born from our attempts (and by our, I mean my friends Richard and Amy, whom I invited to help me cook and who brought the lovely violets that I think make the presentation) to create an award-winning entry into the Marx Foods Morel Mushroom Competition. We were sent 1 oz. of morel mushrooms and asked to make something lovely. Well, creative kids that we are, we ended up making two dishes, and this, my darlings, is the runner up. Can you believe that we found something crazy enough to guild the proverbial lily? And it wasn’t truffled eggs? Make this one first, and then if you want to up the decadence, read our entry in the competition. By the way, I’d be remiss in not thanking Justin Marx for his inclusion of my humble site in the short list of competitors. Talk about good people 🙂 Not to mention their products are ever-so-lovely – I spend hours just thinking how much damage I can do with their fabulous ingredients. A cook’s dream. But I digress, as it’s time for some decadence. This recipe is NOT hard to cook. In fact, the hardest part is the grocery shopping. It does, however, go in stages, with all of the components assembled at the last minute. It’s forgiving, though, so take your time stirring and assembling, and maybe enlist those aforementioned people you love in putting the whole thing together. And then get them to wash the dishes. Round one – prep your morels. Bring your stock to a boil and plunk in your morels. Cover and let sit for 30 minutes or until mushrooms are puffy and lovely. Strain, making sure any grit is poured out with the chicken broth. Slice morels in half and sauté in a pan with 2 tbs. of butter on medium love until soft – about 3-4 minutes. Set aside. Round two – begin by prepping your brioche. Cut out slices from a loaf, or if you want to be ultra fancy, cut out rounds using a 3″ ring mold. Cookie cutters also work well. Plunk 2 tbs. of butter into a skillet and melt on low heat. Turn up the heat to medium low and toast the bread on each side until golden. Set aside. Round three – make your prosciutto chips (and you can skip this step, my vegetarian darlings). Line a baking pan with foil and crank your oven to 450°. Lay prosciutto flat on the baking pan, making sure that the pieces aren’t touching. Place in the oven and bake until crispy and dark rose, about 10-12 minutes. Check once or twice to make sure that it doesn’t burn – there’s not much fat on the prosciutto so they can cook quickly depending on the thickness of the slices. Set aside. Round four – make your bechamel (cream sauce). Melt 2 tbs. of butter in the same pot you sautéed your morels in on medium low. Whisk in the flour and stir until smooth and all incorporated – about 1 minute or so. Slowly add your milk in dribs and drabs, whisking to prevent lumps. Keep on whisking and crank the heat to medium to coax the sauce into thickening. When it gets lovely and creamy, pour in the heavy cream. Whisk and add the black pepper, white pepper, cayenne, nutmeg and salt. Turn off the heat and whisk in the grated cheese. If you are using goat cheese instead of a hard goat’s milk cheese that can be grated, just toss spoonfuls of it into the sauce and stir. Taste for salt and pepper and correct seasoning. Set aside. Round five – egg action. Scramble together 6 eggs, truffle oil, salt and white pepper. Melt 3 tbs. of butter in a skillet on low and then slowly pour in your eggs. Keep your heat LOW the whole time and gently stir your eggs as small curds form delicately. This is a slow process, but not complicated. Just keep stirring until the eggs are creamy and shiny and still a little wet. Pour in the cream and turn off the heat. Now, for the big finish – grab some plates and put a piece of brioche on each. If you are going for fancy presentation, put the ring mold over the brioche and gently put 1/3 of the eggs right into the ring mold. Otherwise, just portion the eggs right over the toasted brioche however you’d like. Split the morels amongst the three plates of eggs. Drizzle a couple of tablespoons of goat cheese bechamel over the works. Sprinkle the thyme leaves and the violets over the entire plate. Spear the top of the eggs with a shard of prosciutto. 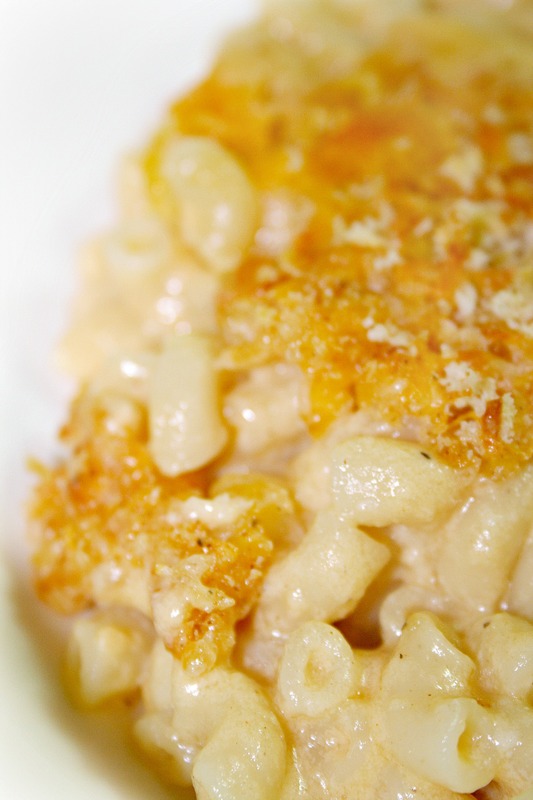 Classic mac and cheese has to be in the pantheon of ultimate comfort foods. Of the folks that deign to make their own from scratch, they each seem to have their own secret recipe that is tailored to their unique tastes. Mine is a perfect reflection of my love of spice and texture – I give the sauce heat with a slew of different piquant ingredients, and add crunch with a lovely dose of panko (japanese bread crumbs). It’s some majesty. There are two schools of homemade mac and cheese recipes – one where the sauce is made from a cooked bechamel, and the other which is made from an uncooked custard of eggs and cream that form a sauce upon baking. I’m in the bechamel school – it’s how I learned to make it from my mom, and we all know that mama is always right. If you’ve never made a bechamel before, it’s an incredibly simple and versatile sauce that you’ll be happy to have in your culinary repertoire. I make my bechamel extra savory with a secret ingredient – grated onion. The bits of onion, cut with a box grater on the fine setting, manage to melt into the sauce, imparting flavor without you tasting distinct bits of onion. Secret ingredients should be just that – a secret. This mac and cheese is interesting as leftovers – the sauce turns into a solid custard, which is deliciously guilty when eaten cold. It’s incredibly easy to cut into squares, which is why I can image Paula Deen (who just so happens to be in the egg custard school of mac and cheese) has fun breading and deep frying chunks of leftover mac and cheese. I personally don’t do this, but I won’t look at you funny if you decide to give it a try. Comfort food should do what you will it to, and if you want to deep fry, there’s no time better than the present. For my darling vegan friends, I have perfected the most luscious version of this recipe with absolutely no dairy. I’ll post it as soon as I make a batch and snap some pics. Preheat oven to 400°. Bring a large pot of salted water to a boil. Cook pasta until al dente and drain. While pasta is boiling, make your sauce. In a large sized pot, melt your butter on medium-low heat. Whisk the flour into the butter to form a smooth paste. Add the grated onion and stir. Slowly add the milk in a steady stream, whisking the whole time to prevent lumps. Add the salt, paprika, black pepper, white pepper, worchestershire sauce, mustard and cayenne. Turn up heat and continue whisking until sauce thickens. Turn off the heat and add the 4 c. of cheese and whisk until melted. Dump macaroni into the pot with the sauce and stir. Pour out macaroni and sauce into a buttered dish. In a small bowl, mix the 2 cups of colby jack, panko, paprika, black pepper and parmasean. Top the macaroni with the cheese mixture. Bake in the oven for 10 minutes or until the top is bubbly and golden. Let sit for 4-5 minutes and then serve. What’s the deal with the price gouging at the grocery store? Makes a girl get all huffy and work on a recipe for homemade majesty to save some bucks. You’ve probably seen/had boursin before, a creamy fresh cheese spiked with herbs and a healthy shot of pepper. The cheese, created in Normandy, is a delicious treat on crackers and bread, and a perennial party pleaser. Problem is the stuff runs about $5-6 for a mere 5 oz. I could warrant spending that much on a fancier cheese, but on something in the aisle next to the Rondele? Forget it. My childhood church put out a cookbook back when I was a kiddie, and one of the recipes in there was a Homemade Boursin. A combination of dried herbs, cream cheese and butter, it was close enough to the original stuff that I couldn’t see a reason to spend the money on the real stuff. To my vegan friends, I’ve made this with Tofutti and vegan margarine before and it is absolutely as good as the vegetarian version. Definitely give it a try – your dairy consuming buddies won’t know the difference. Mix all ingredients well (or blend in a food processor). Serve with crusty bread, toasts or crackers.